Use the full round roller for advanced balance exercises. Full round rollers can also be used for pressure massage. 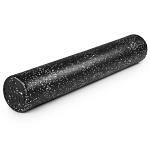 Roll across the target area to relieve muscle soreness and tightness. Constructed of high-density foam.